Sundown Lead-Up Finale: The Heat Was On! It was to be the finale of the Sundown Lead-Up RunSeries, the 3rd and longest LSD with distances of 21km for the HM and 30km for the FM…it turned out to be the most challenging training run we have had to face in the past 3 months of training for Sundown Marathon. 250 runners and Sundown Pacers were presented the ‘Optimal Pace’ plan and brief introductions to the respective Pace Groupings at The Playground @ Big Splash, all staged up with the Sundown tents, signage, posters along with the presence of hydration support from 100 Plus and Nutrition from Maxifuel. The arsenal was well stocked up with enduro-tabs and Viper gels to be able to sustain us for this final long run, before we begin tapering from next weekend. After the lighter moments of the group photos (it was quite impossible to fit all of the runners in there, but we managed quite a good one at the end), the respective groups were flagged off to the sound of the air horn. The stored up energies of the runners were unleashed on the parkway, albeit with help from the SundownPacers to keep to pacers to sustain the fuel. 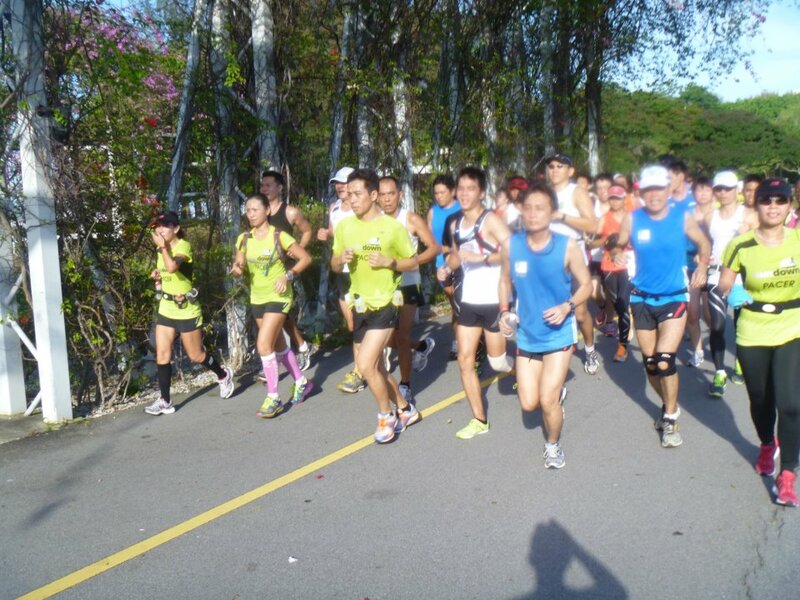 Because the runner groups were large, we confined ourselves to the narrow pathways along ECP and taking care to alert runners and bike users of our presence, helped in part with whistles and shouts from the pacers for traffic control. The paces for the first leg towards NSRCC were a tad fast, but the respective groups soon moderated their paces to the optimal pace targets we were aiming to achieve. Because of the various abilities and objectives of runners even within the same pace group, we had pacers within each group to cover the front, mid-section and to sweep the tail of the group in order that as many of the runners can benefit from the pacing. It sure was a challenge for us as we were faced with the heat from ‘Brother Sun’ who decided to rear himself In spite of earlier weather forecasts of rain in the morning. The Maxifuel station was kept very busy and ‘business’ was exceptionally good (as opposed to the 2nd lead-up run 2 weeks ago in the rain). Thanks Team Maxifuel for your ernest support, for without your fuel and hydration, the majority would not have been able to sustain for ½ the distances we set out to achieve. 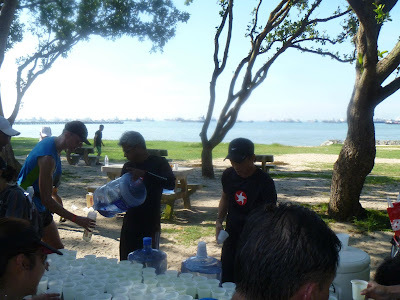 There were long queues at the NSRCC water cooler as the runners topped up their empty fuel/hydration bottles, with perspiration dripping down all the way to their legs and shoes. The return back to Playground was a lot better for the HMers as they headed home for completion. 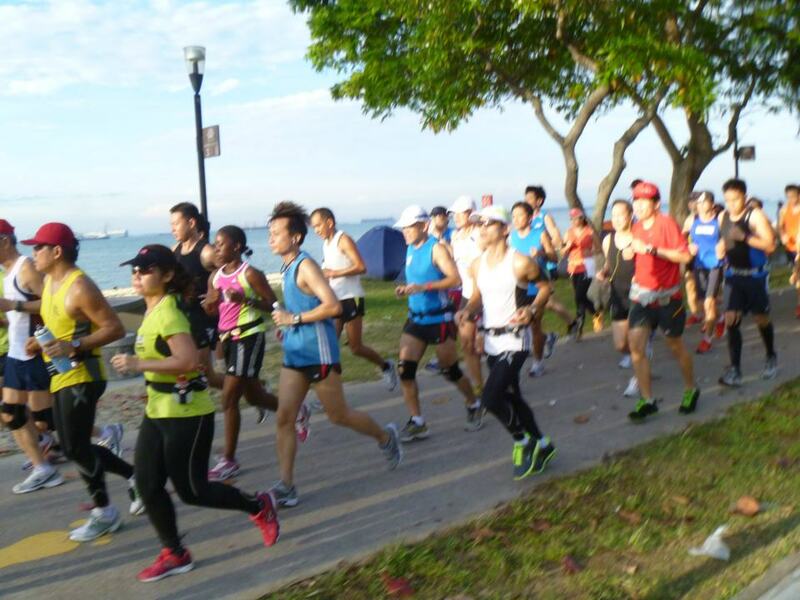 The FM runners were containing their enthusiasm as they knew there was another good 15km or so remaining. Viper gels were downed with more enduro-tab drinks, helping to keep the spirits of the runners high enough to reach the 21km point, all while conforming to the Optimal Pace plans. 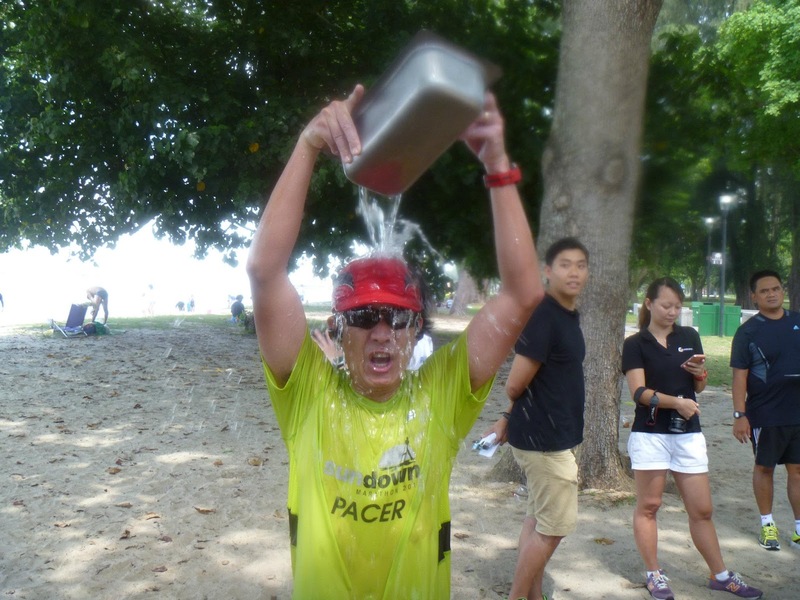 The hydration/chill-out point at the 21km was just too much for some of the FM runners to bear, as they decided to join the HM folks in the Shelter to cool off their ‘frying’ brains. Surprisingly, many of the FM lead-up runners picked up their resolve (probably knowing this will be their final LSD before tapering) to go with the Sundown Pacers for the 2nd 9km leg. The paces were better maintained at that stage, since all were tiring and not as ‘springy’ compared with the first 21km. 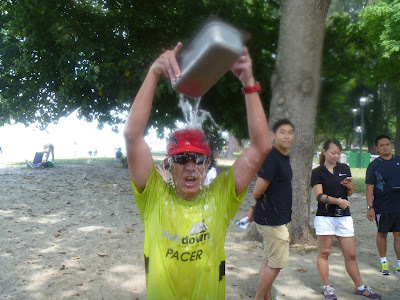 The Optimal Pace strategy does allow for some ‘fade’ in the second half of the race, and knowing that we were able to main the first 21km at pace did help us to persist to sustain that pace for as long as possible. It was sheer delight as we approached the Maxifuel point yet again. A number of us rushed to the toilets at SkatePark to ‘cool off’ with water on our heads, before making our way back for the remaining 4.5km. In spite of the challenging conditions, there were not many walkers outside of the planned walk breaks. Stops at the water points were also brief such that the momentum could be kept up. A few of the runners had signs of overheating and minor cardiac drifts of heart-rates, and were wise to call an earlier stop to prevent any unwelcomed damage to the bodies. It was before long when we finally completed the 30km back at the start point, and many who completed, did very well to sustain their paces all the way. There were a number of surprises too, of runners who were not that conditioned but completed their longest training run in such conditions 0 probably due to the encouragement and pacing provided by the dedicated bunch of Sundown Pacers, as well as the energies derived from running as a group. As we wind down with debriefs with the various lead-up run groups, the FM NightHawks went for their final 5km to fulfill their requirement for the longest LSD in the 12-week structured training program. Already, many of the lead-up runners were looking to do their tapering weekend runs of 18km (HM) and 28km (FM) at Optimal Pace, preferably in the night for some ‘conditioning’ as advised by us. 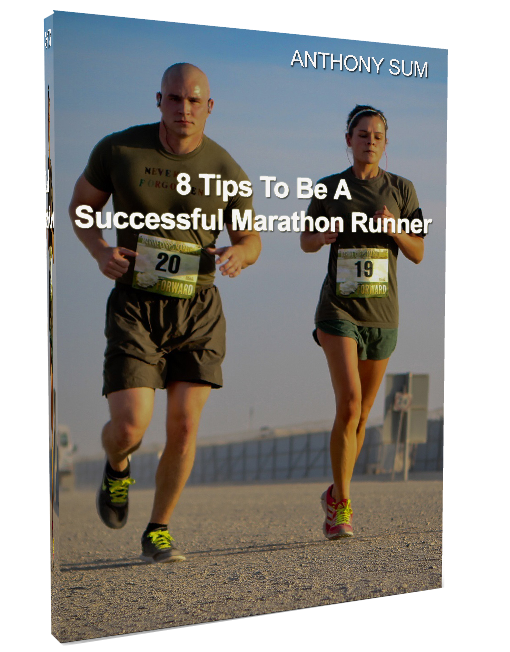 Our observations of this batch of lead-up runners were that they came really well prepared for the training runs, and many of them have good foundation and base to boot. We are happy to note that many of them joining us on race night should be able to do well as they have already shown they were able to meet the challenges of such an ‘extreme’ morning of LSD. If it were to turn out to be cool and windy on May26/27, we could well see many good timings and Personal Bests for HM and FM runners. Here’s wishing all the Lead-Up and NightHawk Runners the best on race night where we will be there as one to LIGHT UP THE CITY – SUNDOWN MARATHON 2012, WE ARE READY!